Dr. Francesco Amato, currently at the University of Rome, was named the recipient of the inaugural Clive Hohberger Technology Award by the Advancing Identification Matters (AIM) industry organization. This award is given annually to scientists and engineers who are pioneers of disruptive technology in the RFID industry. Francesco was honored for his Georgia Tech PhD research in the field of Quantum Tunnel Reflectors (completed in 2017) which scatter signals to radios over remarkably long distances using very little power. 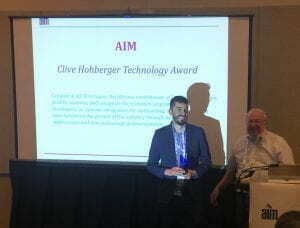 The award was presented at the AIM partnership breakfast on Wednesday, April 3rd, 2019 during the RFID Journal LIVE! trade show in Phoenix, AZ. The photograph shows Francesco receiving the award from its namesake, Dr. Clive Hohberger. The award was named to honor the lifetime contributions of Dr. Clive Hohberger, prolific inventor, collaborator and executive who has become an internationally renowned industry leader. It will recognize scientists, engineers, software developers or systems integrators for outstanding contributions that have furthered the growth of the industry through important applications and new technological developments.